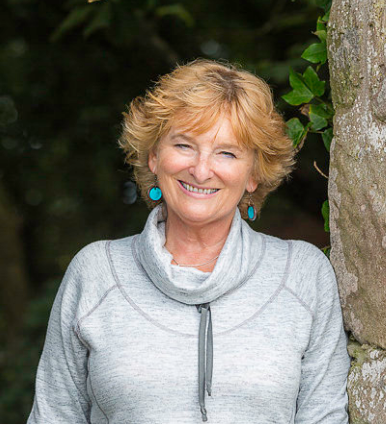 Want a relaxing holiday in the sun, with excellent food, good quality accommodation, great beaches, the warm Mediterranean Sea, a fascinating history and something for all ages to enjoy? 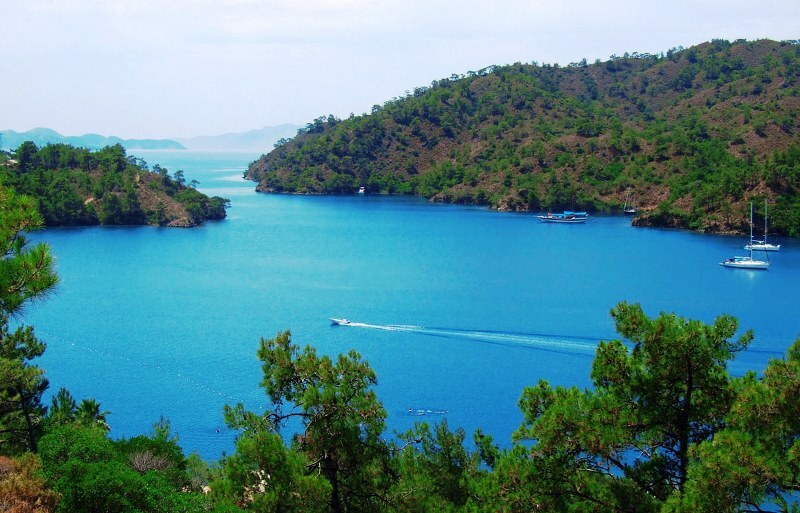 The Turquoise Coast, also known as the Turkish Riviera, in western Turkey, ticks all the boxes. It’s also very good value for money. A trio of popular holiday resorts, Marmaris, Fethiye, and Dalyan, provide everything a holidaymaker could wish for, from late-night party clubs, luxury villas, yacht marinas, famous name brands and top-class hotels to tiny bistros, hideaway bars, souvenir shops and quirky B&Bs plus some of the best-preserved ancient ruins in Turkey. 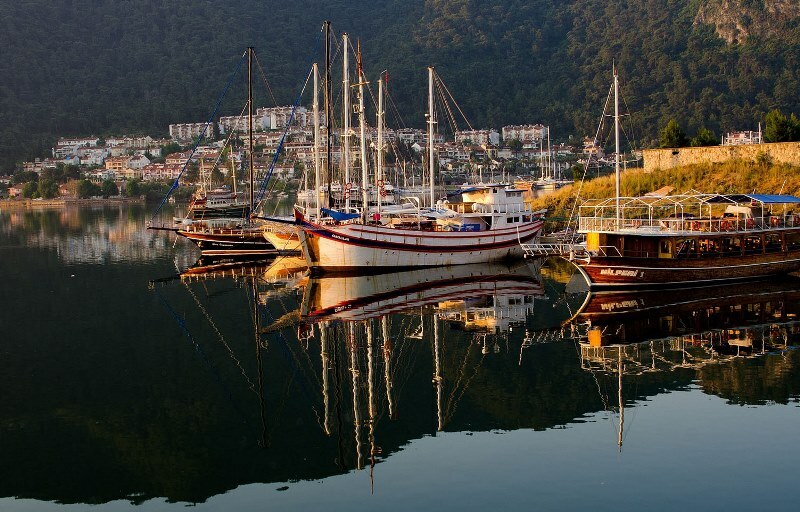 If you’re looking for a lively, fun resort in a beautiful setting with plenty to see and do, Marmaris is the place for you. It’s very popular with younger crowd who enjoy its lively night life and laid-back atmosphere. I enjoyed a quay-side meal of fresh fish grilled on an open BBQ with dolma, stuffed vine leaves, followed by asure, a tasty dried fruit pudding. There are a lot of family hotels and many of the restaurants offer international menus to tempt fussier appetites. 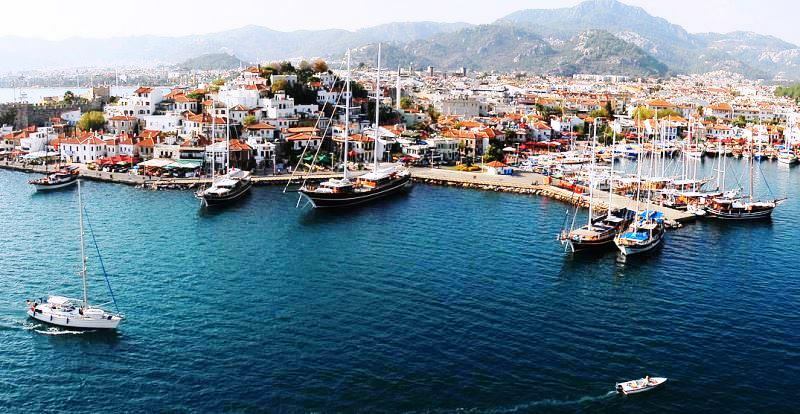 The busy marina has more upmarket places to eat and drink but for a more authentic experience search out the little eateries in the back streets and try tasty Turkish mezes. 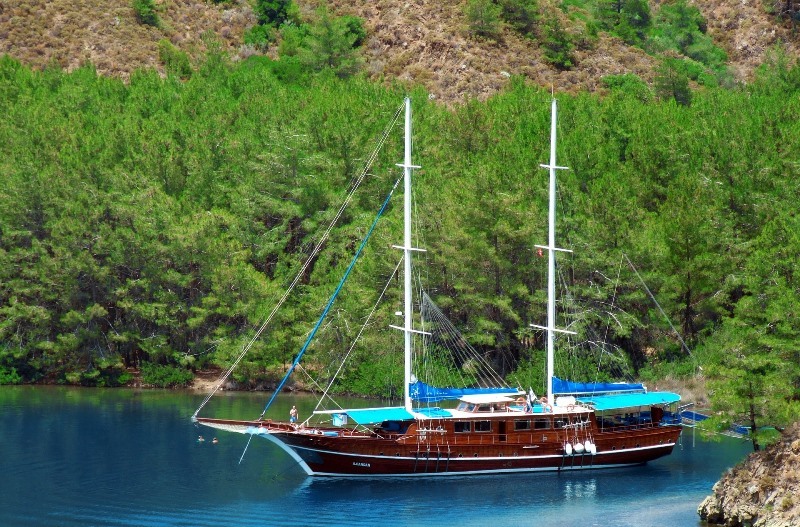 Daily boat trips take tourists to sunbathe and relax in the many tiny coves and islands around Marmaris Bay. 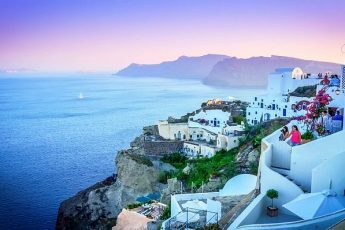 There are plenty of charter boats and excursions to explore the impressive coastline; you can even get the hydrofoil to the Greek island of Rhodes and discover the legacy of the Knights of St John. Go inland to Aphrodisias, with its enormous stadium, amphitheatre and temple to Aphrodite, one of the top sites in Turkey. Further on are the famous hot springs of Pamukkale (Cotton Castle), with tiered pools of blue water layered onto white cliffs. Be warned; like ever-popular Ephesus (a day trip away in the NW of the region), this is a very popular place and if you are visiting in high season be prepared to be one of hundreds vying for the perfect photo opportunity. 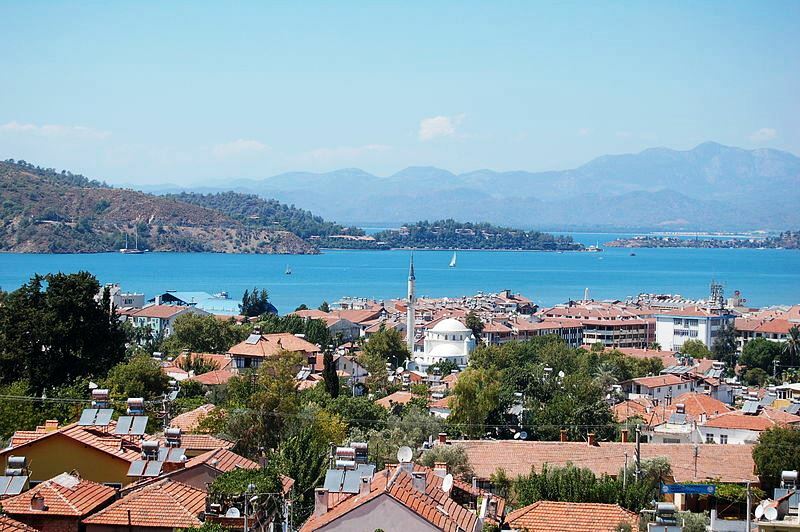 The heart of the Turquoise Coast, Fethiye has changed dramatically in the past fourty years, since tourism started here. I first visited in the early 1980s when there were just a few bars and restaurants. It’s got a venerable history. In ancient times, Old Telmessos became part of Lycia, fell to Alexander the Great and was later ruled by Rome. The modern town was rebuilt after a massive earthquake in the 1950s but walk around and you’ll find many sights left over from its from its past. 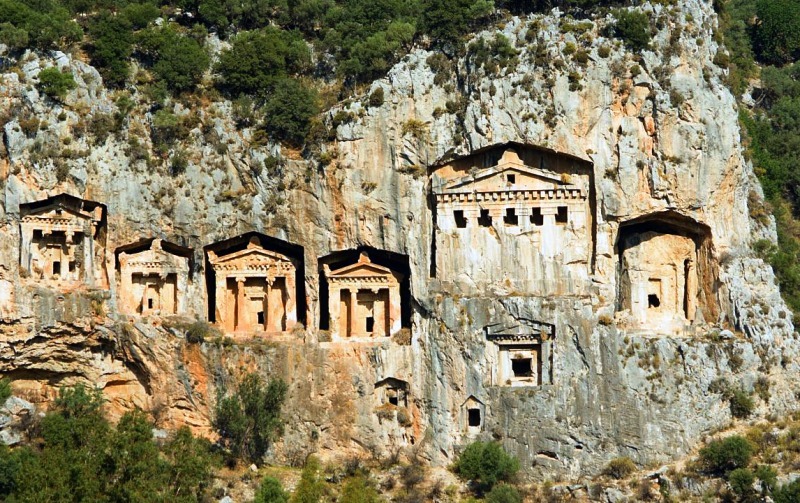 These include a Turkish Hammamm, a Roman Theatre, an Islamic Mosque and splendidly decorated Lycian Tombs. The quayside is the place to be in the evening, watching the yacht flotillas come back home and the big, wooden gullets tie up in orderly rows. 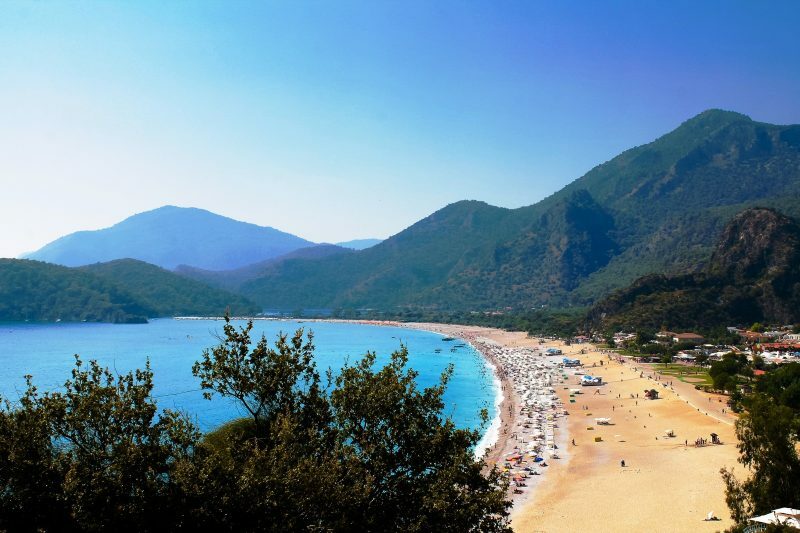 The best beach is Ölüdeniz, a wide, sandy pleasure ground backed by many hotels, bars and eateries. However, it’s also one of the busiest beaches on the Turquoise Coast so search out Calis or Hisarönü for a little more peace and quiet. One of my favourite excursions on the Turquoise Coast was a boat trip to the impressive Lycian Tombs carved in rock, high above the water near the little town of Dalyan. If you want a very muddy spa experience go to the Thermal Baths (VERY muddy) at Ilica. Not far from Dalyan is Iztuzu Beach, breeding ground for the rare loggerhead turtles. I was lucky to see them in the 1980s but they now could be in danger from the huge number of tourists who arrive daily to swim and maybe spot a turtle. History lovers will get their fix at Didyma, an ancient Ionian sanctuary containing the ruins of the enormous Temple of Apollo. Or you could just sit at one of the many open-air restaurants and can watch the river boatmen tout for business whilst sipping thick Turkish coffee ‘black as hell, strong as death and sweet as love’ (Lawrence Durrell). Turkey is such a wonderful country with so much to offer the quirky travellers amongst you. Yes, it has its share of political upheaval and attacks, but so many places in the world do these days. The majority of its people are really friendly and welcoming and the food is delicious. You can get really good bargains for holidays so I do hope you’ll consider going. Your post is reminding me that we have not done justice to traveling around Turkey. We’ve made two trips over the years both to Istanbul. We are seriously going to have to plan a trip along the coast for our next trip. Thanks for the motivation. Oh do hope that you get to the coast Eric. It really is stunning and there’s so much to see as well as the great beaches and warm sea.